In December 2018, forecasters announced a high likelihood that this winter will bring El Niño, which occurs when unusually warm Pacific waters create changes in weather patterns around the world. The phenomenon causes predictable fluctuations in temperature, winds and rainfall, and can be an important indicator for crop yields. But what do we really know about El Niño beyond contemporary times? How much of its variability is natural vs. influenced by humans? Studying weather patterns over time is the first step to understanding current events and how they may respond in a warming world. In order to better attribute and anticipate changes in the climate system, Stanford researchers have been looking past El Niño's recent history, using data captured in coral reefs to reconstruct past events. 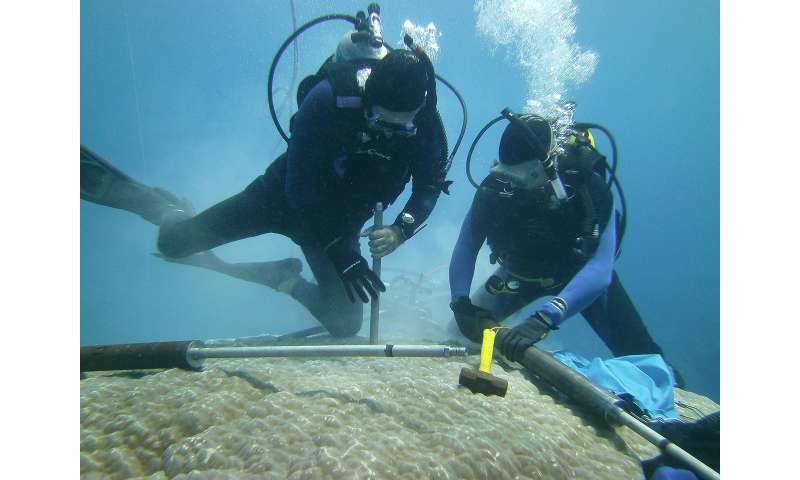 In one such study, scientists from Stanford's School of Earth, Energy & Environmental Sciences (Stanford Earth) analyzed stable isotope data from a 492-year-long core taken from a single Porites coral – the longest such coral core ever collected. The core, recovered near Ta'u in American Samoa in the South Pacific, provides information about changes in the geographic extent and intensity of El Niño and La Niña events over time. Stanford Earth spoke with lead author Neil Tangri, a graduate student with Earth system science professor Rob Dunbar, about the implications of what they learned by peering back through history in that core. What are the elements of El Niño and La Niña and how do they impact us? El Niño is a phenomenon that happens about every two to eight years when the waters of the Western Pacific Warm Pool move east across the equatorial Pacific, creating abnormally warm sea surface temperature anomalies in the eastern tropical Pacific. As they move, they bring with them a region of rising warm air accompanied by heavy rain. This has knock-on effects on global atmospheric circulation that then cause drought in Australia and Indonesia, wet weather along the west coast of the Americas, reduced Atlantic hurricane formation and more. La Niña sees the warm pool and associated phenomena move farther west and it tends to be less dramatic than El Niño. Not all El Niño events are the same, however. The spatial pattern of El Niño is important because of how it impacts different regions around the world. For example, Indian monsoon failure is associated with Central Pacific El Niño events, while wet winters in California are driven more by Eastern Pacific El Niño. What was surprising about your findings? The Ta'u coral revealed a few surprises. One is that the "footprint" of El Niño events has shrunk over the 20th century. In other words, the triangle-shaped wedge of the Pacific that gets warmer when an El Niño happens has shrunk toward the equator and the coast of South America. It's hard to know if this shrinkage in areal extent is related to intensity or frequency. Going back further in time, the Ta'u coral recorded big swings in El Niño activity, but it's hard to tell if that's because of large changes in El Niño intensity or because the footprint has been shrinking and growing. This is basic science – understanding the range of natural and forced variability of the system – and it improves our understanding of the global climate system. Why is it important to understand these from a historical perspective? Because El Niño – and to a lesser extent La Niña – is associated with a lot of extreme weather phenomena, it's important to know how they will change under global warming. Will El Niño become more or less frequent, more or less intense or change in its spatial pattern? There are good physical reasons to support any of those outcomes and we don't know which way the balance of forces will tip. By looking into the recent past, we can better understand the range of natural variability of El Niño and get a sense of how it has responded to small changes in the climate system, such as changing levels of CO2 in the atmosphere. Corals are natural recorders of environmental variables, such as sea surface temperature, that are affected by El Niño. Long records allow us to better understand how El Niño has changed in the past and how it is changing in the present. How can coral tell us about past weather patterns? As corals grow, they lay down a calcium carbonate exoskeleton in annual layers. By counting down layers from the present, we can get month-level precision of the date the exoskeleton was deposited. We then analyze the chemical properties of this exoskeleton to reconstruct sea surface temperature and salinity at the time the coral grew. In most of the tropics, instrumental temperature data only go back to World War II at the earliest, and instrumental salinity data go back to the 1980s. So a multi-century, month-resolution record of those variables tells us a lot about how the ocean has behaved.